Carmen Elliot received her BA in Drawing and Painting in 1971 from UNCG, and continued her studies there through 1975 to receive her MFA in Sculpture and Drawing, with a minor in Creative Writing. She also studied ceramic sculpture at the graduate level at both the School of The Museum of Fine Arts in Boston, MA, and UNC Chapel Hill. Though Elliot began painting and drawing by the age of ten, in college she developed an abiding interest in clay. In her ceramic sculpture, she is inspired by nature, dreams, and myth, as evidenced in The Mother is Sleeping. This piece also shows her interest in working with the human form, which is sometimes “housed” within slab and coil built temples, towers, or doors. Elliot says of her work, “I am particularly interested in making forms that are expressive, and that may evoke a sense of mystery or humor, the fragile or the wild, or a kind of renewal that can unfold between maker, viewer, and the thing created.” Her work is in the permanent collection of the Weatherspoon Art Museum, and has been shown widely throughout North Carolina. 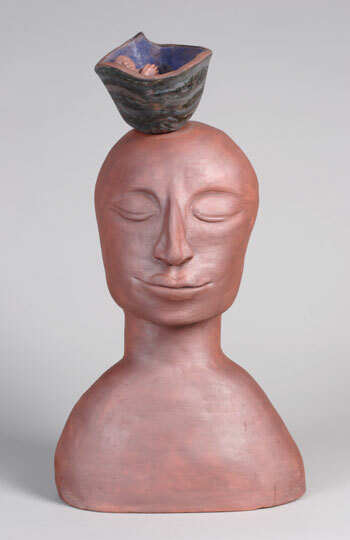 She resides in Chapel Hill, NC where she has taught ceramic sculpture and pottery to children and adults since 1981.